In this scene Uncle Ned learns more about the faerie in his family tree from one of the locals, Captain Selkirk, the grandson of the area's last seanachaidh, or storyteller. In the corner someone joined the violin on a penny whistle, the notes hanging in the air like glittering beads of dew on a slender strand of spider’s silk. Capt. Selkirk took another small sip from his glass, and continued with his story, “It was still dark, that early morning, as the young man followed his steps, lost in a dreamlike state. He eventually found himself in one of the more remote parts of the coastline, rocky and desolate, a lonely place far from human habitation. Afterwards, he said that he thought that he had heard music or singing, and that it was the sweetest sound that he had ever encountered.” Selkirk paused, drawing a long puff on his pipe. Exhaling, he said, “It was just as the sun tipped over the edge of the horizon, lighting the world with her flame, that the boy saw them dancing along the shore. Never had he seen such grace and such beauty, as divine and as holy as God’s own smile. In that moment, he knew that he had to possess one, or go mad with grief from the memory." The midday sun beat down on the Market, thronged with People. The pathways between the stalls were crammed with bodies, occasionally parting in order to make way for the passages of sedan chairs. This particular mode of transportation resembled a box with curtained widows and side doors, and was carried on poles by two bearers. Sedan chairs were more commonly used during the 17th and 18th centuries, and while Alfred knew about them from books, he had never seen one in actual use before. Whoever rode in these vehicles were obviously persons of great rank, for upon their appearance the crowd would instantly melt away to make room for them. Rounding a corner Alfred and Robin were confronted with the sights and heavenly scents of the food, vegetable, and fresh flowers section of the Fairy Market. That it was harvest time was in evidence everywhere, and stalls spilled over with fatly ripened produce of all sorts. Luscious, ruddy-red apples set Alfred's mouth watering, as did the enormous baskets of glistening berries. Behind the vegetable stall a small man dressed in dark green cap and jerkin bowed, and offered Alfred a sample. Alfred moved quickly on when the fairy gentleman smiled, revealing row upon row of glittering, pointy teeth. In the next booth the attendant was selling shaved ices in small silver bowls that changed color as they were consumed. Alfred saw two fairy children greedily eating these, and sticking their tongues at one another, laughed merrily to see their tongues change color as well. Under a brilliantly colored tent that was striped gold, green, and violet sat fairy women of surpassing beauty, absorbed in the task of weaving floral wreathes for one another's hair. At the entrance of the tent were two spiral topiary forms, covered in tiny buds. Alfred drew closer to look, as the buds appeared to be on the point of blooming, but instead the buds turned into butterflies, blue, buttery yellow, and crimson, and flew away. Through the crush of the throng came yet another sedan chair. Robin, who was feeling rather out of circulation, craned his neck to see who rode inside. It was a fairly opulent vehicle, even by sedan chair standards, the surface covered with all manner of scrollwork and filigree. A lady's hand trailed from the window, her sleeve dripping with rose tinted lace. A large, sparkling jewel flashed on her finger before the hand was drawn back inside, and the lady's face momentarily peered out of the window. It was a beautiful face but cold and calculating and Robin knew it well. "By Oak, Ash, and Thorn," swore the hobgoblin quietly, "what on earth is Mab doing here?" Eliza Roane-Twistleton: thirteen years old and the eldest child of a well-to-do London family of the 1880s, Eliza's world is thrown off balance when her father, a faerie anthropologist, is stolen away by the faeries. Her nights are disturbed by strange dreams involving magical creatures, and Eliza's Uncle Ned is convinced that the dreams may be key in discovering the whereabouts of his nephew. 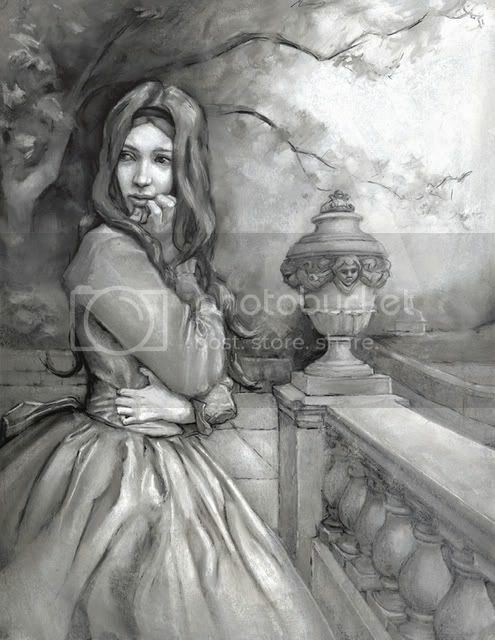 The mystery leads them to Scotland, and the scene below is of Eliza exploring the grounds of her family's ancestral home, in search of fifteen year old Duncan, the groundkeeper's son. As she hurried along, Eliza wondered how Alfred and Robin were managing. While she had convinced herself to trust the hobgoblin, she knew that fairies could be very dangerous and easily offended, particularly if one made the mistake of being rude to them. 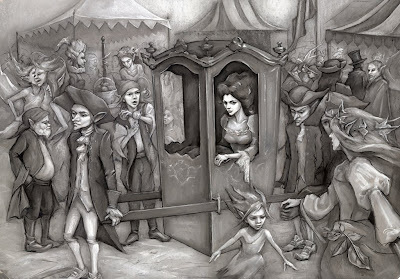 Fretfully, Eliza wished that she had thought to remind her brother to be careful of his manners while visiting the Fairy Market. The elf locks had also been a disturbing development, and now Eliza questioned whether or not she should have mentioned her conversation with Esme to her great uncle, and if perhaps it was even a mistake to be wandering around the grounds alone. Several more garden spaces had slipped by when Eliza had the distinct and unnerving impression that someone or something was watching her. As Eliza stood beneath an ancient oak tree with outspread branches that resembled clutching claws, a cool wind blew around her, picking up leaves that swirled like miniature tornados. Over her head there was a chittering sound and Eliza’s head jerked up to see poised above her two small men dressed in green with oak leaves woven together to form waistcoats. Beneath their caps their ears curved into a point, and one them smiled nastily, revealing very sharp teeth. In the hand of one of them struggled a bird, and causally the fairy bit its head off. The body of the bird went limp. Eliza let out a small scream and backed away just in time as three more appeared from behind the gnarled trunk of the tree. Eliza fled the outdoor room by way of the closest exit she could find. Fairy folkes are in old Oakes, Eliza thought wildly, recalling the phrase from one of her father’s books. With her heart pounding, Eliza tried to wrap her mind around the notion that she had just encountered oakmen. This makes no sense, she thought franticly, oakmen come from the North of England, not the Highlands of Scotland! Passing from one outdoor space into the next, Eliza spun around, looking for the exit. Around her the theme now focused on a series of globes, carried through in both the statuary and the shrubbery. Enormous green bulbous shapes seemed to hang in the air, and for a moment Eliza had the unpleasant sensation that they remained aloft due to an increase of tension in the atmosphere. From behind the various topiary forms stepped out other fairy men, none more than two feet in height, but all exuding ill intent. Queasy with unease, Eliza’s legs felt rooted to the spot. Scarcely daring to breathe, she willed herself to turn around in order to discover the exit. On the far side she saw a circular shaped portal leading out. With a gasp she tore herself from the spot and made for the door. Without a backward glance Eliza ran as fast as she could. With her feet pounding, sometimes silently on the grass, sometimes thrumming a staccato against stone, Eliza imagined the grinning faces that she had seen earlier leering from every corner, mocking her attempt at flight. Tears started in her eyes, and she tried to push such thoughts from her mind. Unbidden, images of the torn and twisted bedclothes appeared in her mind’s eye. Something wishes me harm, she thought. Tears blurred her vision, and she made for yet another door. Her steps were suddenly brought up short as she skidded to a halt. Before her was the opening of an ancient hedge that easily stood twelve feet in height. It was the doorway to the Labyrinth. 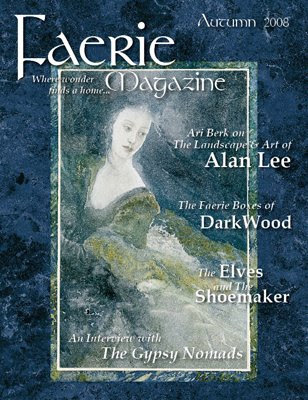 The Fall 2008 issue of Faerie Magazine is still available at better bookstores such as Borders and Barnes and Noble, and in it readers will find my interview with artist Julia Jeffrey. 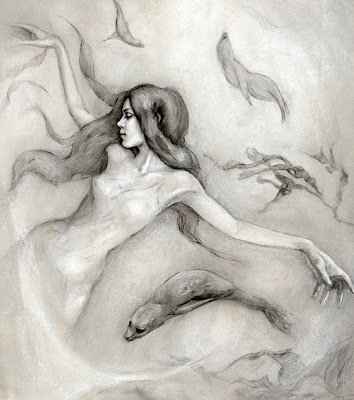 Julia is of course the illustrator of Faeries in the Gloaming, and toward the conclusion of the feature there is some discussion of the book. If you have already read the interview we would both be pleased as punch if you could share your thoughts about it! Greetings, folks! Above you will find Julia Jeffrey's cover mock-up for my book (which, like all of Julia's work, I completely adore! 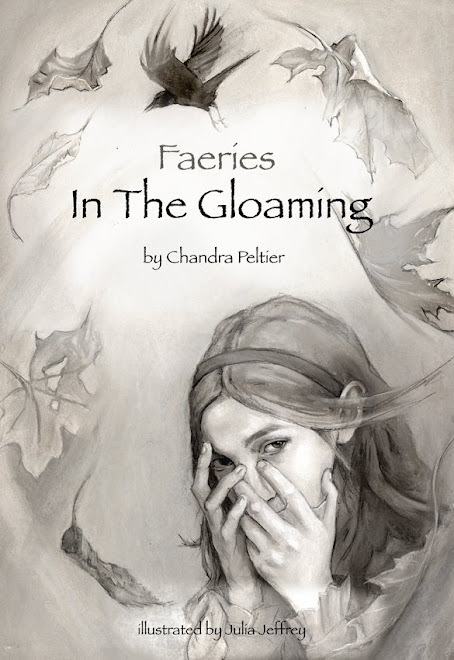 ), Faeries in the Gloaming, and an excerpt introducing the character of Robin. Because the hobgoblin had attempted to disguise himself as a Martinware bird jar, Robin currently finds himself trapped in that form due to a fairy artifact that the children's father popped inside him just prior to vanishing. Uncle Ned and the children, unaware that the bird "jar" is alive, believe that the artifact is connected to the father's disappearance. Since Eliza's dreams center on a mermaid, Uncle Ned theorizes that the phases of the moon, so associated with the tides, might have some affect on the bird "jar", and decides to place it in a window to see if the fullness of the moon can trigger a reaction. …a loud thud woke Eliza, and she sat up with a start. Barely aware that her brother and uncle had awakened as well, Eliza stared in fascination at the bird jar. Thinking that it must be a cloud passing over the face of the moon that had caused the momentary illusion of movement, Eliza let out a muffled scream as she watched in horror as the bird jar turned his head to look at her. "Good Heavens!" exclaimed Uncle Ned, as he and Alfred scrambled to their feet. "Please do not be alarmed on my account," the bird calmly replied. "I believe that you were looking for a result. I hope that I do not disappoint!" "Do not engage the creature in conversation, Eliza," thundered Uncle Ned, "until I have had an opportunity to examine it!" "I am a he not an it," the crow said in a rather wounded tone, "and my conversation has always been regarded as engaging!" With this remark the crow attempted to bow as an additional flourish, but his wings refused to cooperate and the effect was not pleasing. "It appears to be alive." Uncle Ned circled the crow with a half wondering, half terrified expression. Curiosity had by now overcome fear in both children, and they crept closer to their uncle and the ruffled and undeniably live creature. "Of course I am alive, you nitwit, in spite of your repeated attempts to spear me with all manner of iron keys!" the crow snapped. "Is this how you treat all of your guests? No one has thought to inquire about my needs, or to offer me a bite to eat!" "Impertinent creature!" growled Uncle Ned. "Now see here," said Alfred sternly. "What have you done with our Father?" "The proper question," replied the crow "is 'What has your father done to me?'. I am a hobgoblin, a shape shifter by nature. The moment your father popped that object inside me, I have been stuck in this ungainly body. I cannot shift back!" The bird gave them all such a reproachful look, that Eliza felt compelled to apologize, "I am sorry, and I'm sure that my father did not do so intentionally," she said in a soothing tone. "And I think that you are a lovely bird." "Well, don't give the creature airs," Uncle Ned said in disgust, as the crow began to preen with ill-concealed vanity. "Tell us why you were here in the first place," Alfred demanded, "and tell us your name!" Alfred was attempting to look threatening, despite his rumpled nightclothes and hair that currently resembled a frightened hedgehog. "Manners," chided the crow. "One never asks for another's name, very rude." "Why ever not?" Alfred said irritably. He was secretly wondering if they should try breaking the crow jar one last time by smashing it against the wall. "Because," Uncle Ned replied slowly, "knowing a fairy's true name gives one power over the creature." "We have not had any practical experience in dealing with fairies," Eliza explained apologetically, "only theoretical. May I ask how you prefer to be addressed?" "This one I like much better, her good breeding is evident," the crow said, tilting his head at Eliza. He drew himself up and said with obvious pride, "As your Shakespeare once said, 'I am that merry wanderer of the night', known more commonly as Robin Goodfellow, liege man to His Majesty King Oberon, High King of all who dwell in Faerie. For those who find favor with me, they may call me Puck!" Eliza, well familiar with the hobgoblin called Puck from William Shakespeare's fairytale play A Midsummer-Night's Dream, that tricksey character capable of either acts of kindness or of leading hapless human victims astray. She and her uncle regarded the crow with speechless astonishment. Alfred's reaction was completely different. The crow's announcement caused Eliza's brother to dissolve into giggles. "I fail to see," said the crow coldly, "the humor in anything that I have said." "This is the first time," Alfred said, laughter bubbling up again, "that I have ever met a crow named Robin!" That said, Alfred clutched his sides and hooted hysterically. The crow literally bristled, his feathers nearly standing on end in irritation. Before the conversation could devolve much further, Uncle Ned had recovered enough to insist, "You still have not explained your business here! As a member of Oberon's court I find your presence, so soon after the disappearance of my nephew, highly suspicious!" "I would be happy to answer your questions," said the crow, now known as Robin, "provided that you supply me with some vittles, preferably some eggs and b.! I've not had a decent breakfast for weeks!" "He means eggs and bacon," Eliza said before Alfred could ask. She glanced out of the window to see light creeping into the morning sky. The salmon pink dawn vaguely reminded her of her dream. "It's frightfully early," she said, "but I imagine that we could convince the cook to make us some food. I believe that we could all do with a good breakfast." A faerie astride a dragonfly, a hobgoblin trapped inside of a crow, and troubling dreams about mermaids are all part of the mystery when Eliza and Alfred's father is stolen away by the faeries. After the kidnapping the children travel to the Highlands of Scotland to find their father. Not only do they learn that they have faerie blood, but their father's disappearance is part of a darker plot by Queen Mab to bring together the Unseelie Court and the Unforgiven Dead in order to wield unimaginable power.